Got old bananas? 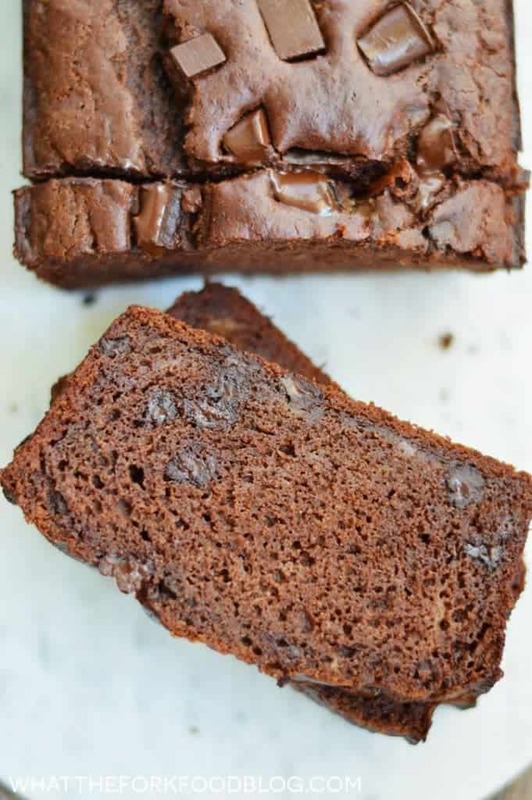 Make this gluten free double chocolate banana bread! 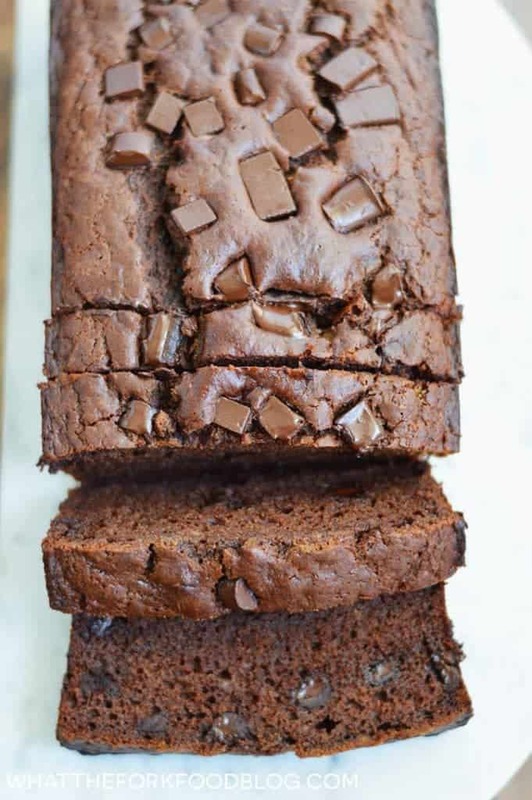 It’s full of chocolate and banana flavor PLUS it’s studded with chocolate chips. Perfect with coffee! I used to be a banana bread purist. Bananas, nuts, that’s it. 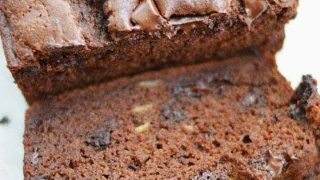 I wrote about it quite passionately when I first posted my classic banana bread (I’ll be updating this recipe soon). But then I had kids who ate bananas – until they didn’t eat bananas but I kept buying them over and over because they *might* ask for a banana. And we make a LOT of banana bread which means my kids have become expert banana mashers. Luckily, they eat banana bread better than they eat the actual banana. Kids. Eat yo’ food! Since I make so many banana breads, I can’t just make the same banana bread every time. I mean, there are some days I make 4-5 breads in a day. Full sized breads, not minis. THAT’S A LOT OF BANANA BREAD. I’ve been experimenting with a bunch of fun banana bread flavors. All of them have been hits. I have so many banana bread flavors to share, I might just have to start an eBook for them. Would anyone even be interested in that? Let me know, I might have to make it happen! Might take me 6 months to get it done, but sure – eBook for banana bread lovers. Today’s version is a double chocolate banana bread. 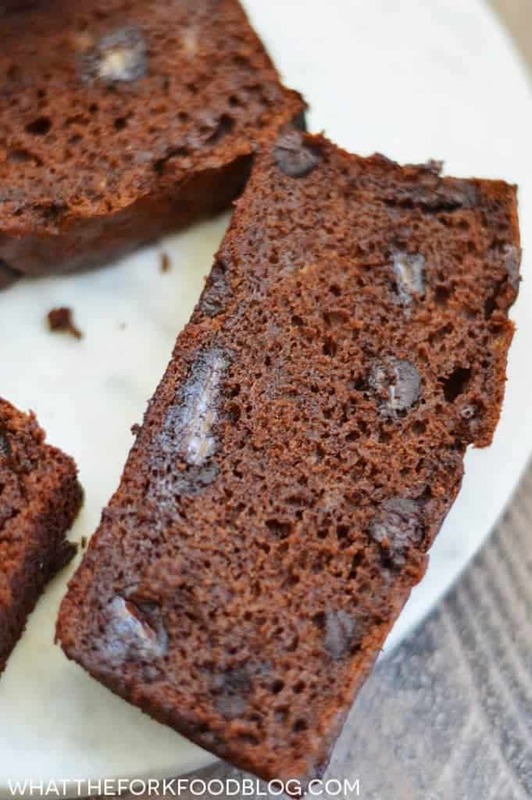 You leave out the chocolate chips and just call it a chocolate banana bread but why would you want to leave out the chocolate chips. They’re the best part! I like to add extra on the top to make it even prettier and chocolatier. Scrumptious. Preheat oven to 350 degrees and spray a 9x5 inch loaf pan with non-stick cooking spray. In a large bowl, whisk together the flour, cocoa powder, xanthan gum, granulated sugar, brown sugar, baking powder, baking soda, and salt. Stir in the chocolate chunks to coat with the flour. In a medium bowl, whisk together the eggs, mashed banana, milk, oil, and vanilla. Pour into the dry ingredients and mix until combined. Pour the batter into the prepared baking dish and bake at 350 degrees for 50-60 minutes or until a toothpick comes out clean. Cool on a wire rack before wrapping and storing in an air-tight container. If your gluten free flour mix contains xanthan gum, you can omit the amount called for in the recipe. This bread freezes really well. Defrost at room temperature. 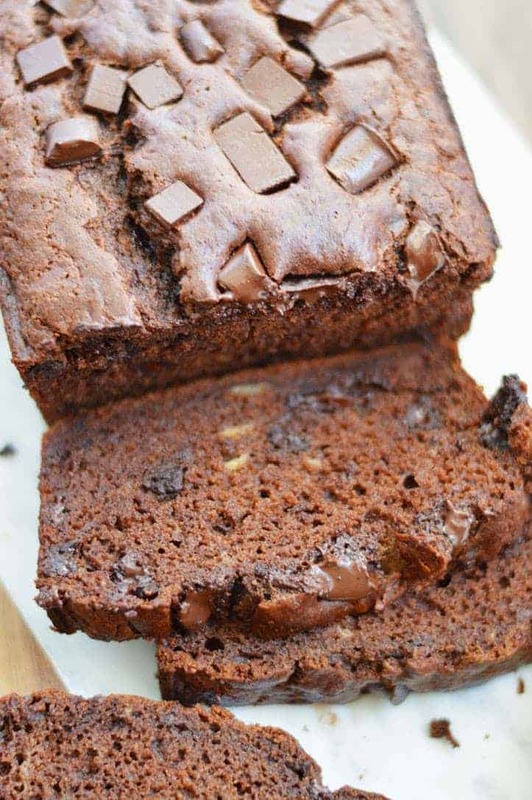 I absolutely love banana bread but I have never seen or tried it with chocolate. This sounds amazing! 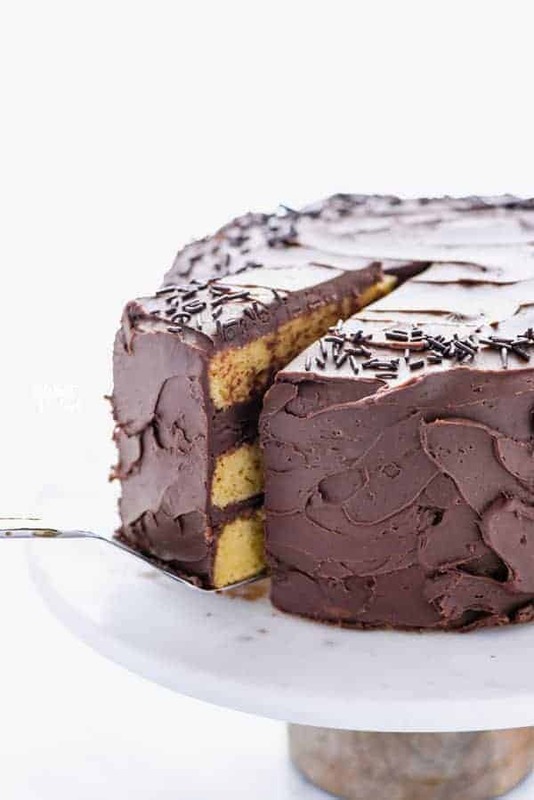 It’s so good with chocolate – you need to try it sometime! I’m always looking for new recipes to use up overripe bananas. This loaf looks perfect! I know my family would love it! Thanks Michelle, it’s so good! I love your idea to make an e-book…that would be a true celebration of all of your yummy breads. Looks amazing! Is it possible to substitute the sugar with stevia and the brown sugar with palm sugar or something else? Can’t wait to try it! Hi Erina – I don’t bake with stevia so I would not be able to answer that for you. 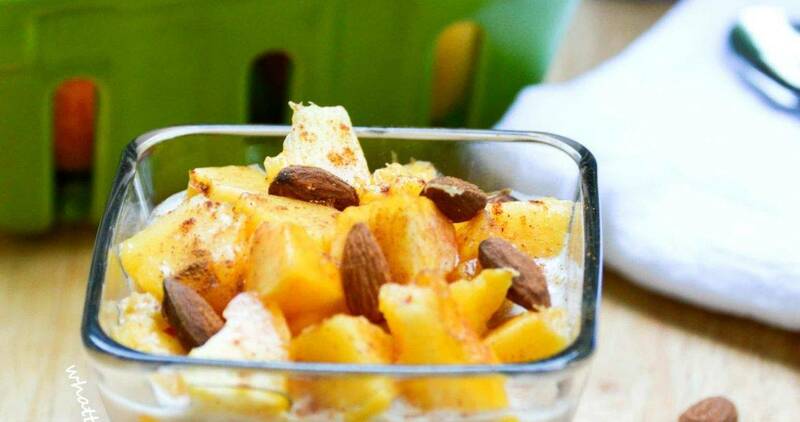 You could definitely swap the brown sugar for coconut sugar though! You could even swap out all the sugar for brown sugar and add a tablespoon or two more of the milk. 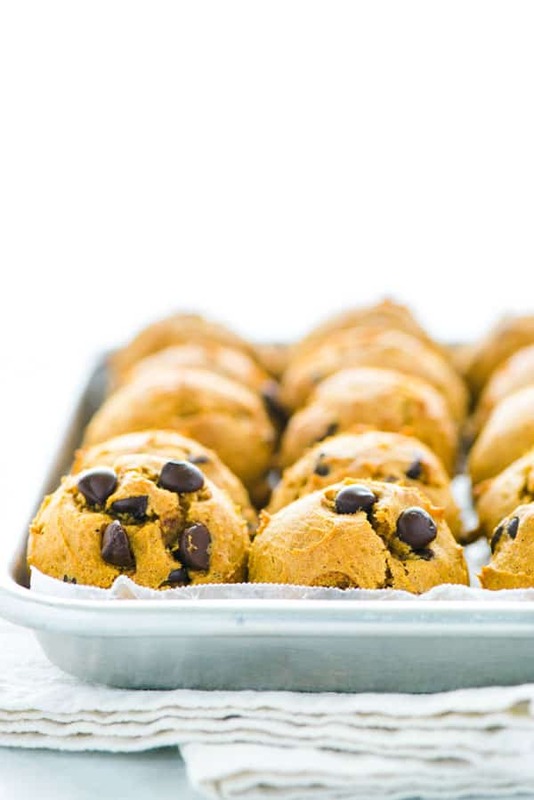 Is there a specific gluten free flour you used? I know that different all purpose gluten free flours act differently. Hi Laura, I use my Nightshade-Free Flour Blend here but my White Rice All Purpose Blend would also work well. i have a problem with mine having a gritty taste. what am i doing wrong? Hi Eileen, what flour blend are you using? Thanks Linda! And no, not a stupid question! I make this often with unsweetened coconut milk from the carton.